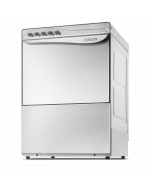 The Kromo AQUA series of under counter commercial dishwasher has a stainless-steel cabinet to ensure a hard wearing and durable machine that is also aesthetically pleasing. A powerful rinse booster pump provides washing power to remove heavy soiling from plates and crockery. A double skinned door ensures quieter operation and reduced energy consumption. Fully automatic operation is guaranteed through automatic detergent and rinse aid dosing pumps that are integral to the machine. Operators simply activate the two-minute wash cycle through an easy, ergonomic control panel. Supplied with 1 glass basket, 1 dish basket and 1 cutlery holder as standard. Drain and water connection hoses for UK fittings also included as standard. 13 Amp power connection for easy plug-in-and-play installation. 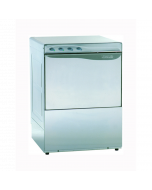 In hard water areas, the glass washer should be used with a water softener to ensure quality wash results and preserve life of the machine.